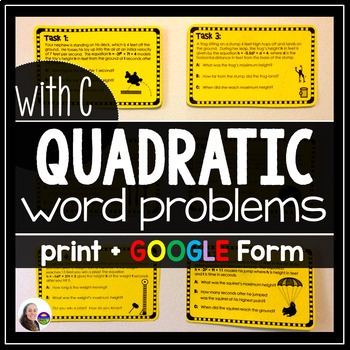 Algebra students can choose to factor, use the Quadratic Formula or their graphing calculators to solve quadratic word problems covering zeros (roots), vertex x, vertex y and y-intercept in this activity. 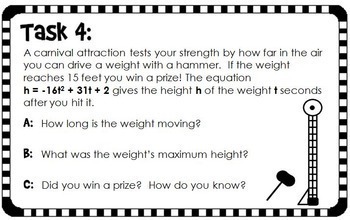 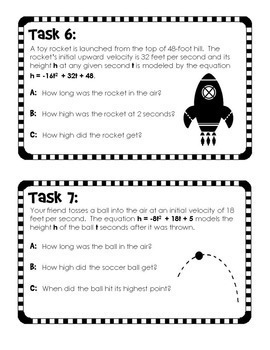 The task cards in this download ask students to find how long objects are in the air (zero or root) how high the objects traveled (vertex y) and how long it took to get to that highest point (vertex x). 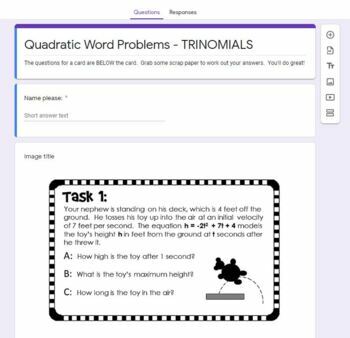 This download includes 10 task cards [each with 3 questions covering zeros (roots), vertex x, vertex y and y-intercept], an unknown area bonus card, a student response sheet, an answer key and a separate (optional) QR code sheet that students can scan to check answers.